Custom Printed Accent Wrap Sunglasses are good promotional gifts for athletes and people engaged in sports activities regularly. These custom sport sunglasses consist of Gray lenses and colored accent. The Blue, Yellow, Red and Gray colored accents provided within the Black frame gives these promotional sunglasses a smart look. 100% UV protection ensure that they will make the user impressed beyond the looks. Utilize the 1" W x 1/4" H imprint space on the temple for best brand exposure. Order now to get free artwork design and free online proofs facilities! 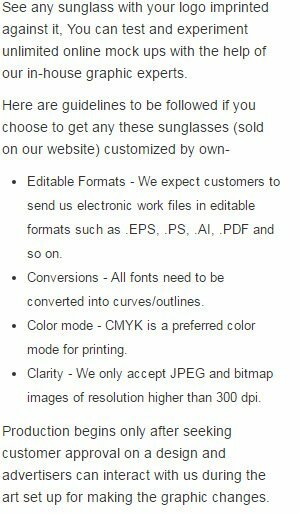 Request a quote to know price cuts that you can avail for wholesale Custom Printed Accent Wrap Sunglasses.